You can turn off the audio recordings with this nanny cam, which is vital if you live in a State where audio recordings are illegal. Most nanny cams don’t give you the ability to switch off audio recording, making the Foscam F19816P a great option. One point to note about the Foscam F19816P is that it is not actually wireless. it is advertised as being a wireless IP camera, but it still needs to be plugged into the mains power to work. 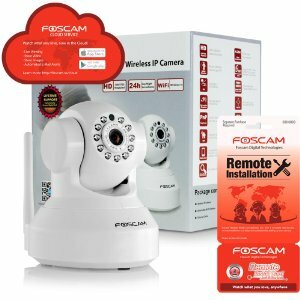 The Foscam F19816P is the latest Foscam wireless IP camera, which is a popular choice for parents who want to keep a protective eye on their family at home. You can also make sure than an elderly relative is a safe at home, as well as watching what mischief your pets get themselves into when they are home alone. All you need to do is to set it up (and set up is a breeze with the Foscam plug & play technology) and you are good to go. You will receive email alerts on your smartphone or tablet whenever the motion detectors go off at home and so you know exactly what is going on at any time. It might be wise to turn off the motion detectors if people are moving around at home or else you will be constantly notified all day long. First of all, this nanny cam does not have a zoom, play lullabies, have a temperature sensor or send you notifications when sounds are detected. 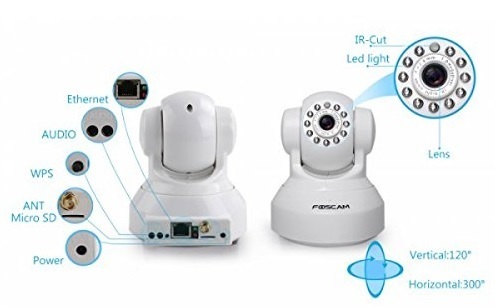 As a ho me surveillance camera, these omissions might be fine for you (maybe not the zoom though), but if you want to use the Foscam F19816P as a nanny cam, you might prefer one or all of these features as well. If, so you can select one of the other nanny cams and read their reviews here. 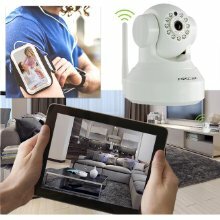 This Foscam security camera is perfect for home surveillance, so if you purchase it as a nanny cam, you can just re-purpose it when the children are grown. So with this nanny cam, you can talk to your children at home and they can talk back to you via the nanny cam and you can also sing a lullaby to your baby to help them drift off to sleep. 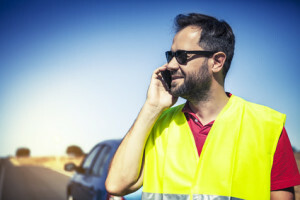 When you have to work odd hours, late nights or you are away at a conference, feeling guilty that you are away from your young family is always a problem. With the Foscam F19816P however, you can chat to your children anytime you are free – you can even talk to them while you are at the office and help them with their homework. If you have a baby, then being able to still feel part of the family when you are at work is awesome. With the Foscam nanny cam set up in the nursery, you can chat to your partner when they are changing or feeding your baby and sing a little lullaby to help them drift off to sleep. When you need to leave your little ones with a babysitter, you always need to be ultra careful. Of course we can vet the babysitter and if they are a friend or relative we always trust them. However, having an extra level of security doesn’t hurt, does it? So once you have your Foscam security monitor set up in the nursery or in a few extra rooms dotted around the house, you can always pick up on any behaviors that might concern you – which you would have otherwise missed. You can store any of the snapshots and videos you take with the Foscam wireless IP camera on the SD card and then transfer them to you r PC. Foscam also have a cloud storage option as well and give you a free 30 day trail of their cloud storage, which you can continue at the end of the 30 day trial if you like this way of storing your photos and images. Cloud storage is a great option, because your precious memories are always kept safe, even if your computer is stolen or crashes. As soon as your computer is online again, you can simply restore all of your photos directly from the cloud. Read my review of the iDrive free cloud storage here – iDrive stores all your files, documents and other family photos as well, making backing up your hard drive even easier – and you get 5GB of free storage in the cloud with iDrive.